How much flavor can we pack into one plate? As I’m writing this post, I’m actually feeling waves of sadness that this dish is not in front of my face at the moment. That’s how special it is. Soooo. Anytime I’m ordering greek-style food or greek inspired dishes, you’re ALWAYS going to find me going for the app plate. The hummus plate, the Mediterranean platter, whatever it may be, I want tastes of everything. That’s not unusual with most cuisines. I always want tastes of everything. I not-so-secretly might be the millennial that orders four dishes just to taste and share. But with greek food, there are so many delicious dips and dippers and OLIVES!! and roasted peppers and cheese. It’s like my pickled and brine-loving brain died and went heaven. If heaven was sprinkled with feta and olive oil and lemon. To say that I’ve exhausted this marinade would be an understatement. It’s originally from my cookbook and I’ve used it on chicken and pork and shrimp. Additionally, this salad? You have GOT to be tired of seeing it. I’m always tired of seeing it until I taste it and then I’m like, why am I not making this every single day?! The flavor is unreal and potent. It makes me care about veggies and actually do ridiculous things like crave them. That so rarely happens. You know this. Because no matter what it takes, no matter how many days I force myself to eat vegetables in a row so I love them, they will never be my number one authentic choice. They might be my number one I’m-feeling-smart-today choice. But real life choice? No. 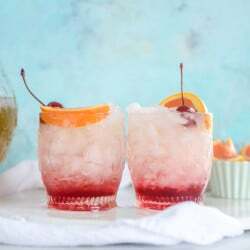 I feel like this is the third time I’m saying it in a week (and perhaps the 310th on this blog) but don’t freak over the ingredient list! It’s long, but it contains a lot of the same ingredients for separate parts (e.g. dill for the dressing, dill for the tzatziki) and everything makes it win together. This is a huuuuge platter and I certainly don’t expect you to make this for dinner on a random Wednesday, but I hope that it serves as inspiration for more mini hummus platters in your very near future. And the steak should be made all the time, period. Because after throwing this plate together I discovered my very real and very weird love for flank steak strips dipped in hummus. What the what? No, I’m definitely not pregnant and yes, you should try it ASAP. Face smash explosion is the only way to describe it. Place the flank steak in a baking dish and season with salt and pepper.In a bowl, whisk together the vinegar, lemon juice, honey, garlic, dill and oregano. Continue to whisk while streaming in the olive oil. Cover the flank steak with half of the dressing. Let marinate at least 4 to 6 hours, or even overnight. When ready to cook, you can sear it in a cast iron skillet (I do about 5 minutes per side) or you can place the flank steak directly on a preheated grill. If it’s about 1-inch thick, grill for 5 to 6 minutes per side to still have some pink in the steak. When you remove the steak from the grill, let it rest for 10 minutes. In a large bowl, combine the shallots, tomatoes, cucumbers, olives and half of the feta. Pour the rest of the dressing over top and let the mixture marinate anywhere from 30 minutes to overnight. It’s SO delicious the longer it sits! 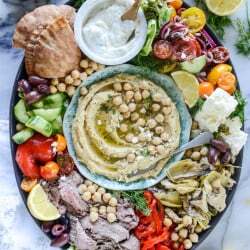 Arrange your platter with the hummus in the center and spoonfuls of the marinated salad, the flank steak strips, peppers, artichokes, extra feta chunks, pita bread, tzatziki bowl and lemon wedges. Devour! Add all ingredients to a food processor and blend until combined. You can leave this as chunky or as smooth as you’d like! Waist deep in hummus. That’s the way to be.